November 1st and 2nd are a Peruvian holiday known to some as All Saints Days, or The Day of the Living, and The Day of the Dead. They are holidays celebrated to a much greater degree in other Latin American cultures, such as Mexico. In Peru, it's pretty subdued, and mostly another reason to eat good food. On November 1st, you can see long line-ups in the streets for fresh-made tamales as early as 6 am. Special cookies and treats are made unique for this day, as are special-made breads. Pan de Wawa (Baby bread) is given to girls as a special treat, and the Pan de Caballo (Horse-shaped bread) is given to boys: all come in a range of sizes. The other famous dish of the day is Lechón - deep-fried pig. The Day of the Dead is not to be confused with Halloween. It is probably mere coincidence that the two days coincide so close together on the year's calendar. In fact, Halloween is only an emerging holiday celebrated with trick-or-treating to restaurant establishments and stores in major Peruvian cities, but is not known to most rural folk. Rather, The Day of The Dead is a holiday of Catholic origins, celebrated by those who believe in purgatory. On November 2nd, you will find every cemetery full, as family members and friends go to clean up the grave sites and niches, to bring new flowers, the person's favorite foods, and even entertainment and prayers. 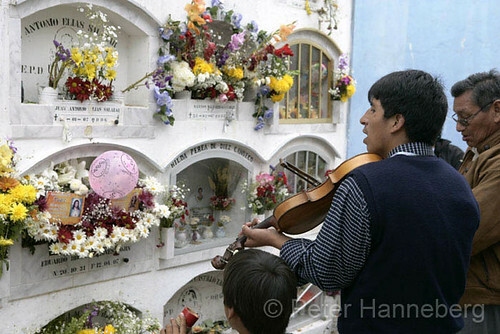 Local singers and music groups are paid to play music by the loved one's grave site, just as elected persons are paid to pray certain rote prayers. Tears are shed, but it's generally an upbeat day, with families gathering together, sharing food and beverages, telling stories and remembering the good times. So, if you are in Peru on these dates, now you know why there are hardly any locals in the streets, why every cemetery is full, and what's up with those 'Baby' breads!